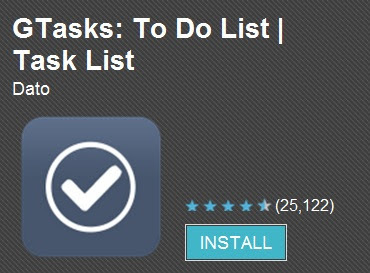 GTasks is the best and free Todo list application that I have been using since I baught my Android phone, Samsung Galaxy S3. I use this to organize my daily activities and sometimes I used this applicaiton to take notes too. It is pretty flexible and user friendly! There are few good things about this application and I think this is good to share with you. Some are it I didn't aware of them until after I use it for certain period. Able to synch with Google tasks. So you won't lose all your todo information because you can always synch back later. Has categories but you need to create them. When you create your task, it defaults to "All" categories. You can go to Menu->Move to List, then choose the List/Category that you want this task to be categorized too. If the List/Category doesn't exist, you can click on the "New List.." to create them. Has other normal todo list features such as due date, reminder, set recurring task, and setting prioriy. For priority, it only allows you to set urgent or not urgent. 2 levels of prioritization only. :) It allows you to do sorting too either by date, name or priority. Very user friendly. You can put it in widget to show All or specific category/list tasks at your home screen without even open the application. When you are in the application, you can swipe right or left to switch to different task category which I find this is extremely handy. There is only one bad thing I would like to comment for this Gtask applicaition is when you try to delete multiple tasks at the same time, it doesn't work. The software itself allows you to do that but it seems like has bugs. It lags very badly and after that you check on those tasks, there are still there. You can download this application here or just search for Gtask in your GooglePlay store.